PHOENIX -- Wes Timmons thought it was another march to the baseball gallows. Eight of his A's teammates had already been cut from big-league camp in the previous 24 hours, so when he received a summons to the manager's office, Timmons figured he shared their fate. "I just assumed it was that time," he said. Timmons is, after all, a 33-year-old infielder -- and elementary-school substitute teacher -- who has played 998 minor league games in his 10-year pro career and hasn't spent a single day in the big leagues. Not as a doubleheader fill-in, not as a September call-up and, until last year, not even as an invitee to a major league club's spring training camp. He entered Bob Melvin's office and took a seat. The manager read Timmons some of his spring statistics -- which, at the time, included a .323 average (10-for-31) with four walks and a .405 on-base percentage, though just one extra-base hit, a double -- and the two discussed how the spring had gone. Then Melvin asked a curious question, "How's your Japanese?" Timmons burst into a smile, as the realization dawned on him that he'd be joining the A's for their season-opening trip to play the Mariners in Japan. "I am more than willing to learn," he replied. Two games shy of 1,000 in the minors, Timmons is on the verge of shedding the label of "real-life Crash Davis," the frequent joke he's heard the last few years, even if the fictional character in the movie Bull Durham at least had a cup of coffee in the big leagues. "Minor league baseball has changed a lot since then," he said, "but when you watch the movie, I'm like, 'Well, that kind of fits, I guess.'" Every profession has its rites of passage, but few entail such celebrated bumps in the road as being a minor league ballplayer, for whom perseverance is defined by a series of incalculably long bus rides through mid-sized minor league cities. There are the eight-hour bus trips that are actually better than the alternative: when the bus breaks down along a scorched Southern highway, as happened to Timmons years ago. There are the days the motel's hot water runs dry. There's the hotel in Savannah, Ga., whose air conditioning fails on a 100-degree afternoon. And plenty more. "We could talk for hours," Timmons said, shaking his head at the memories. None stand out more than the day the outfield wall caught on fire. Ivy had grown along the wooden fence during the offseason at the home ballpark of the Mexican Pacific League's Mayos de Navojoa, and on the winter league's opening day in late 2010 the greenery went ablaze with red and orange flames. "For whatever reason the fans thought it'd be cool to set the ivy on fire," Timmons recalled. Play was stopped for half and hour -- on two separate occasions -- and the fire burned a hole in the fence. "We finished the game with part of the centerfield wall not being there," he said. Those incendiary delays weren't even the worst part of his stay. In the second week of the season a fastball struck Timmons on the left arm. The club took him to get an x-ray -- at a dentist's office. "So that was fun," he said with a wry smile. He also noted that such minor league travails grow less outlandish in the higher levels of the minor leagues. Besides, other than seven weeks last season, Timmons hadn't been below Triple A since 2006. He has been a man stuck in baseball limbo. Just last week Timmons sounded like a man beginning to accept his baseball destiny -- that a major league promotion may never come. "That's the road God has chosen for me, man," he said then. "That's who I am, just kind of hanging around. If it comes, it comes. If not, you know, I've had a great career up to this point. I don't really have a whole lot of regrets on the field." Timmons, a utility infielder who has primarily played third base in his career, is coming off his best season, batting .341 with a .420 on-base percentage in 95 games split between Double A and Triple A in 2011. His lack of power -- he's never hit more than eight homers in a season -- is a detriment when compared to the prototypical third baseman, but his versatility in playing every infield position helps. "It's hard to get the guy out," Oakland assistant general manager David Forst said. "He's played himself into the conversation, very much so." The A's were in need of extra infield help after projected starting third baseman Scott Sizemore tore his ACL early in camp. But roster decisions aren't always linear; one injury doesn't necessarily bump everyone up one spot on the depth chart. 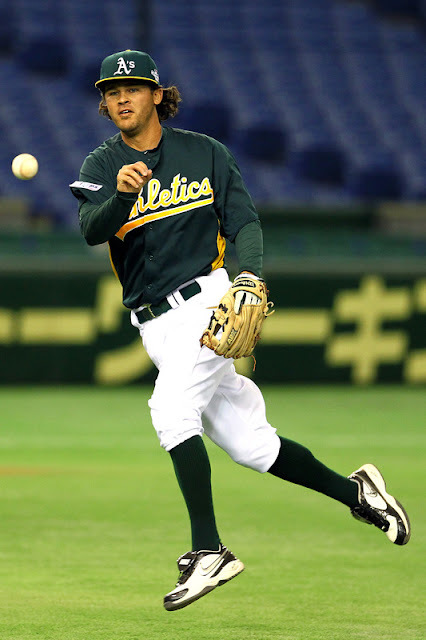 Though the A's will need to whittle the roster down to 25 players for the rest of the season, they will travel with 30 to Japan and will designate 25 players to dress before the two games with the Mariners. "He's played well enough that he deserves to go," Melvin said. "He should be proud of that." Timmons' situation is complicated by not being on the 40-man roster, which means that, not only does he need to be good enough to make the club, he needs to sufficiently outplay the competition that the club is willing to remove another player. Making this trip to Japan does not guarantee placement on the 40-man. If he does eventually make Oakland's 25-man roster, he'd be the oldest position player on the rebuilding club; only pitchers Grant Balfour, Bartolo Colon and Brian Fuentes are older. "He's veteran-minded, but he's still got that youthfulness where you don't really expect that he's been in the game that long," said second baseman Jemile Weeks, the 25-year-old starter who lockers next to Timmons. "He'll give you the impression that everything's fine and dandy. He's not a complaining type. He acts like he's just getting started, and he's happy to be here." Each of the past few winters Timmons has huddled with his wife, Randi, in their Jacksonville, Fla., home and deliberated whether it would be best for him to retire or to trudge ahead with his major league dream at the expense of time and distance away from his family, which includes two daughters -- Kallyn, who is almost six years old, and Irelyn, who is three. "So we weighed the pros and cons of coming back, and God willing and my wife being so wonderful, I'm playing again," he said. "Would I rather be working 9 to 5 or playing a kid's game? I've gotten to the point in my career where the money has gotten a little bit better, and there are just not a lot of jobs in this world that are better than what I'm doing." Modern technology makes the separation from his family almost bearable -- "If it weren't for Skype or FaceTime, I don't know how anybody ever did this," he said -- but he knows he's missing out. Also, minor league salaries are a pittance compared with even the major league minimum of $480,000. The salaries for even veteran minor league free agents can be less than $20,000 for a season; only a handful of players make more than $100,000. Most make something in between, including Timmons (the exact terms of his deal were not disclosed). Timmons has his degree in physical education -- he began college at Appalachian State and later transferred to Bethune-Cookman -- and spends his winters as a substitute teacher at Chets Creek Elementary School, where his wife and mother teach fulltime. "Any subject you can think of, kindergarten through fifth grade," he said. "Some of the students follow [my baseball stats], and some of them make fun of me because I don't hit a lot of home runs. I get it from all ends of the spectrum." Taped above Timmons' locker at Phoenix Municipal Stadium is a baseball card of Chipper Jones. A mischievous teammate placed it there, a regular reminder of Timmons' stunted progress. The Braves drafted Timmons in the 12th round in 2002, and Timmons advanced at a typical pace through the minors, reaching Triple A for the first time three years later, only to be blocked from the major leagues in a way few recent players -- a Yankees shortstop prospect, for instance -- could appreciate. "These guys clown me over here a lot," Timmons said of his A's teammates, "because I happened to play third base over there [with the Braves], and we all know who's their soon-to-be Hall of Fame third baseman." Timmons said he never had a formal invite to Braves major league camp and only played sparingly in spring games as a backup. He figures he got nine at bats in three years, meaning he often had some time to kill on the dugout bench. Outgoing and gregarious, Timmons figured he might as well pass the time in conversation and ultimately learned a lot from Jones' predecessor at the position, Terry Pendleton, who for most of the past decade served as Atlanta's hitting coach. "A lot of that time I would hang out on the bench and talk to players and coaches," Timmons said, "number one, to pass the time because you've got to figure out how to spend three and a half hours and, number two, if I might be able to bring something with me." Timmons credits those conversations with Pendleton as an important lesson in honing his disciplined approach at the plate, even with two strikes. He's never been a power hitter, but in only one minor league season did he have an on-base percentage below .375. For his career he has walked 468 times and struck out only 287. After making consecutive Triple A All-Star teams in 2009 and 2010 but finding his path still blocked in Atlanta, Timmons signed as a free-agent after the 2010 season with Oakland. There he not only had the best season of his career -- with personal bests for batting average, home runs, RBIs -- but made his mark in other ways, too. "He ran the best kangaroo court I have ever seen," said A's pitcher Brandon McCarthy, who was making a scheduled rehab start in Sacramento when he witnessed Timmons presiding over a riotous clubhouse scene. "He was really good and really funny. Usually they all collapse in the middle and the rules are weird, but he was on top of everything." Part of Timmons' deal with his wife was always this: When the door to the big leagues closed, he'd walk away. Last July Timmons thought his dream was over. The A's, facing what they called a "numbers issue" on the Triple A roster, demoted Timmons to Double A, a move that made him six years older than all but one of his position-player teammates. Timmons called his wife and said, "I'll come home." After some discussion, however, they decided that he should honor his one-year contract, and so Timmons packed for Midland, Texas, barely a fifth the size of Sacramento, and joined the Double A Rockhounds, an experience he initially described as "very humbling." But a funny thing happened on his demotion to obscurity: He crushed the ball. Timmons hit .365 and at one point had a 15-game hitting streak. He made new friends and the front office received glowing reports. "We had to send him to Double A, which we didn't want to do, but he took it great," Forst said. "He's a professional. I heard constantly from the Double A manager -- 'Hey, this guy's a veteran and he's great in the clubhouse. He's great with the younger kids.' We made sure to get him back to Triple A as soon as possible." After 39 games Timmons returned to Sacramento, but that's as far as he got in 2011. Lacking space on the 40-man roster, the A's were unable to promote him for a September call-up to the big leagues. "I had no expectations," Timmons said. "I've never been in the big leagues. A lot of guys have been there and when they don't get called up in September, it's a real disappointing time. It makes the Triple A clubhouse kind of tough." After the Triple A playoffs ended, Timmons began his long cross-country drive. He had reached West Texas when his phone rang. Forst prioritized Timmons as his first call of the offseason and extended the invitation for a return. "I've never had anyone call and just say they appreciated what I've done in a season," Timmons said. "That phone call by itself pretty much got me hook, line and sinker back to the A's." Another phone call on Monday morning was even better. Upon leaving Melvin's office, Timmons called his wife, who was at the zoo with their daughters, and told her to start packing for Japan. "I'm not sure she believed me," Timmons said. "But she was super excited." At the end of the call Randi asked, "What am I supposed to do?" Timmons responded, "I have no idea. I'll have to call you later. What do we do?" It's a whole new world for the minor league journeyman. Eight months ago Timmons called his wife and offered to fly east and home, his baseball dreams over; this time he called to offer her a flight west, his baseball dreams having taken a step closer to coming true. 讓 我 們 一 起 替 Wes Timmons 加油 !